The good thing about working for my current company is that we work hard, yet we play hard. Daily fruits, free coffee/Milo/tea, free use of the community gym, heated pools, and tennis courts, annual cricket matches, whole-day off-site team-building sessions, company-paid team lunches and farewell dinners, etc. This morning we're off to the Cruising Yacht Club of Australia near Rushcutters Bay Park to go sailing with our firewall and mobile IP clients. The sailboat we used for the day is sleek and shiny. I asked our skipper and he said the boat costs about a million dollars. Just the sail alone, made of Mylar and Kevlar, costs hundreds of thousands of dollars. 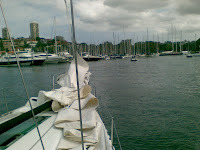 We sailed out using the onboard motors, then anchored off some unknown bay (unknown to me) and had lunch on the boat. There were prawns, oysters, salads, chicken and breads. 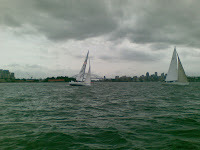 Afterwards, we put up the sails, and cruised around looking for other ships to overtake. Went back to the wharf around 4pm, and back to the office for more work. Went to Botoli Restaurant (宝多利餐馆) at Burwood for the pre-CNY dinner that GF organized for our friends. Good food and great company. There were two kids with us, and the laughter is just non-stop as kids truly say the darnedest things.